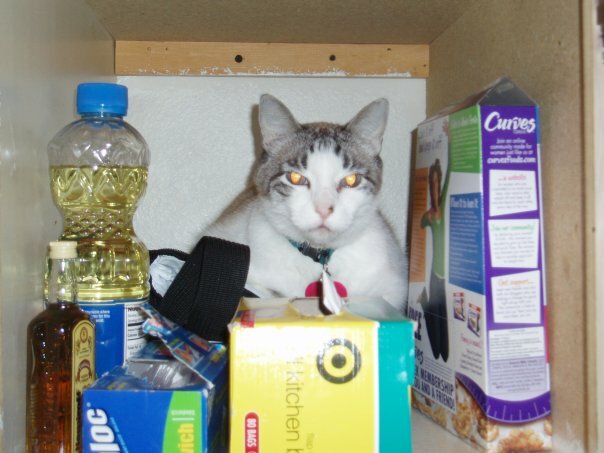 Here is one of her cats hiding out in the pantry. My friend, Gail, really loves cats, especially her cats. I have mentioned Gail before in a post about string cheese and tampons, but I’m not sure if I have mentioned how much she loves cats? Everyone that knows Gail knows she loves her cats. Her cats love her, too, of course. In fact, one of them was so angry that Gail left for vacation once, that he peed right on her clothes in her suitcase. How dare she leave him! Gail didn’t realize it that a such a crime had been committed, though. Soooo….Gail pulled out those gym clothes from her suitcase and wore them to exercise. Gail was on an exercise bike at the gym in said gym clothes. Gail was beside a very attractive man. Gail noticed him sniffing the air. Gail realized, in horror, that her cat peed on her gym clothes and that he was sniffing the air to find out where THAT SCENT was coming from (I am actually not sure WHEN she fully realized she was walking around smelling like her cat’s tinkle). So, Gail played it off….and started sniffing the air beside her in an attempt to somehow persuade the very attractive man that it was the person beside her that smelled like cat urine and sweat. I’m not sure the man was convinced…or maybe he was? I wish we knew. Here’s the deal: cats are intentional, smart and cunning. And sometimes really mean. That’s why I don’t like cats. My blogging friend, Kimberly, from My Inner Chick wrote a recent post about her cat, Charlie, WHO PEED ON HER SON’S HEAD. Kimberly’s son’s head. On purpose. Case closed. I’m not much of a recipe sharer on this blog, but…I couldn’t pass this one up. Ha!!! Right? Ha and ew? You may have seen this cake before, but it was a new one for me. I REALLY laughed at this cake. If you have a cat lover in your life, or want a fun Halloween dessert, you just HAVE to make them this cake. I really don’t see that you have any choice in the matter. 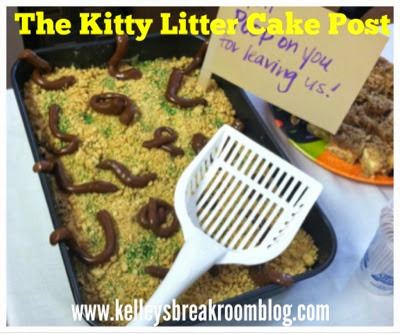 Serve it in an actual kitty litter box with a kitty litter scooper! Originally published a year or so ago. Something like that.